XperiFIX - Take back control! In this guide, I’ll show you how to use XperiFIX. 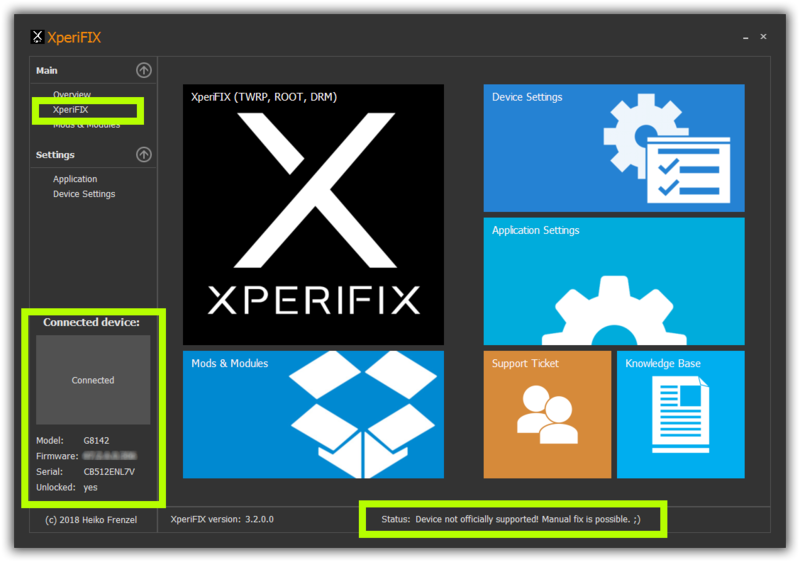 There is the automatic mode with presets (Devconfig) and a manual mode for experienced users who want to use XperiFIX for devices and firmware versions that are not officially supported. Please read the instructions carefully to avoid mistakes that could lead to a “brick”. 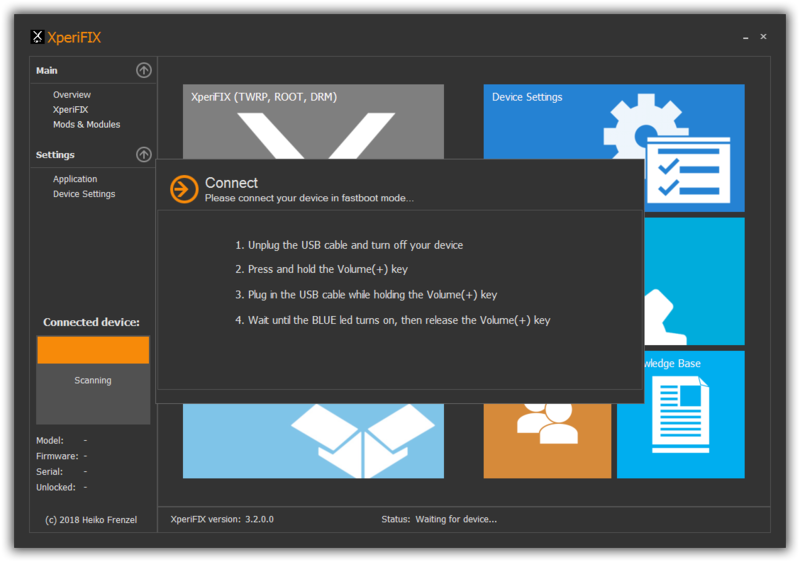 To use XperiFIX, you need a Windows PC (Windows 8.1 is best) and the appropriate Sony device drivers for your smartphone. Please note possible further dependencies, listed on the product page. As soon as you have purchased the software, you will receive a download link and the personal activation license by email. You can also download the software at any time from the website (Support -> My downloads) when logged in. Please keep the license data well. Download the software (installer) and run the installation as an administrator to avoid installation errors. After installation, you can start the software. You will be asked for the license data. Please enter in the respective fields the email address (with which you bought the software) and the key that was sent to you by email. 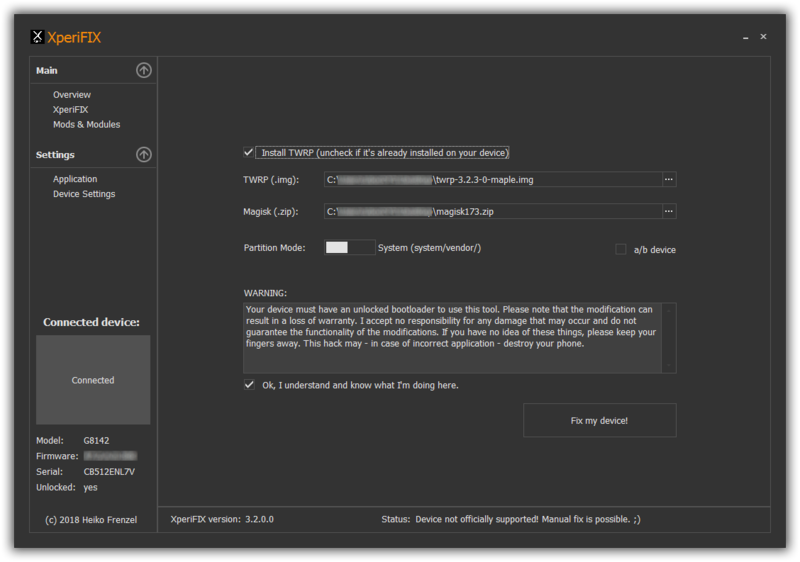 Confirm the entry and restart XperiFIX. Note: If you are asked for the license again after the start, please check the entry. Also make sure that XperiFIX is not blocked by a firewall. The software requires access to the Internet. After the start of XperiFIX, a scan is performed for a suitable device. Please make sure that no Android devices are connected to the PC. Now the device should be connected to the PC in fastboot mode (bootloader). XperiFIX detects the device and issues a status message at the bottom. Either the device is officially supported or there is the possibility of a manual fix. After connecting the device, select “XperiFIX” from the left menu. There you will find an input mask for the required files and settings. If the device is officially supported and the associated information is in the Devconfig, the settings are automatically entered. If the device is not officially supported, the informations must be entered manually. Please do this only if you really know what you are doing. Here you can choose whether to install the TWRP recovery from XperiFIX. For devices on which the recovery is already installed, you can uncheck the box. Please note that with “RP only” devices (eg the XZ2 or XA2) the TWRP recovery can not be installed by XperiFIX. You must manually install the recovery on these devices before you can use XperiFIX. For an XZ Premium, XZ1 or even XZ1 Compact, you can select the installation of TWRP, if it has not already been installed. 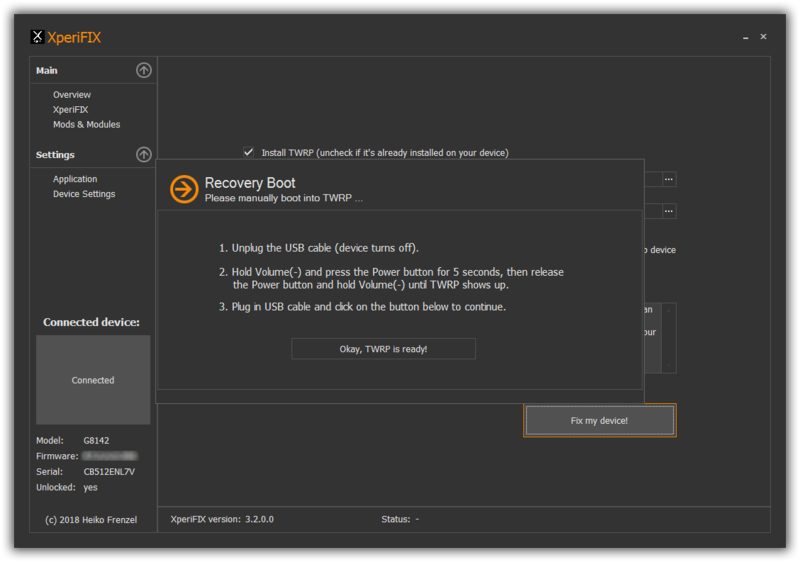 Here you can select the desired TWRP recovery image. You can either use the default (Devconfig) recovery or choose your own recovery. You can specify a URL (Internet) for an remote image or select a local file on the PC. Here you can select the Magisk package. Please make sure you are using a Magisk version above 16.3. Otherwise, there could be problems with the DRM patch. Please choose the partition mode for your device here. This option indicates whether the device has a “vendor” partition or not. With a Sony Xperia XZ Premium, for example, there is no “vendor” partition. The vendor files are located on this device within the “system” partition. So you have to select “system” for this device. An XZ1, for example, has a “vendor” partition, so you’ll need to select “vendor” partition mode for this device. Here you can select if it is an a/b device. In such a device, an alternative DRM patch is selected. Use this option, for example, with an XZ2 or with an XA2 device. Once you have made all the settings, you can read and accept the warning. Then you can start the process by clicking on the button. Important: If TWRP boots and you are asked if you want to allow it to be written to the system partition, please swipe right! XperiFIX must be able to write to the system partition. Once TWRP is up and XperiFIX is reconnected, it will make the necessary changes to the system. Please do not interrupt the process. Once XperiFIX is done, a message will appear and the device will restart. Now all work should be done.